A wedding should resemble the personalities of the two individuals tying the knot. From the flowers, setting, food, music, down to the invitations, every part plays a large role is setting the theme and tone of your big day. Many couples have the expectation as they plan the wedding that their invitations need to be cream paper with engraved black writing. Although this is the preference for many couples, this does not have to be the case. 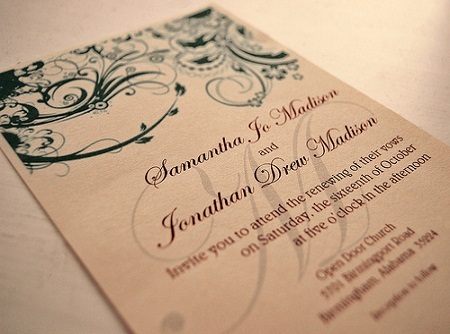 Creative invitations that you make yourself are fun, memorable, and can even save a huge chunk in your wedding budget! To get you started here are some ideas that might perfectly suit the vision of your big day. Message in a Bottle — This idea is great for those planning a destination wedding. Popularly on beaches, this type of wedding calls for a creative invitation. A perfect way to get your guests excited for your wedding on the beach is to make a message in a bottle invitation. You should start by finding the bottles that you will put the invitation in. This can be done by researching wholesale suppliers online. If you don’t mind them not being uniform, try scavenging local yard sales and flea markets. For the invitation, write it with a formal calligraphy pen and roll it up so it fits inside the bottle. Package these up carefully, and send them out to your guests! Artwork Invites — Those couples who are creative and want to spend a little more time on their invites should definitely stick with this idea. If your wedding is around the holiday, paint your invitation onto Christmas ornaments and send them out. A painted plate or mug with your wedding details can also serve as a great invitation while also providing your guests with a memento of your big day. Video Message — This idea allows guests to be personally invited by the happy couple. Have a friend record you and your fiancée in casual setting, like on the couch in your home, and give a short summary of your proposal, dating experience, etc. Next, outline the plans for your big day and all the important information. Copy your recording on DVDS and send it out for your guests to watch. Remember, pick a day where you and your fiancée are in good moods. You don’t to make it seem as if you and your fiancée are not happy together. If you and your fiancée want to stick to a more traditional invitation but still would like to make it yourself, here are some ideas to make the process go smoothly. Printable Invites — If you don’t like the costly idea of sending your invites off to the printer, but don’t want to find the paper yourself, many companies offer wedding invite kits. These provide you with the basic materials you will need; all you have to do is print your information onto them! This also allows you to decorate and embellish them as you wish. If you want to add a flower cut out in the right hand corner, you have the freedom to do so. Flower Pressed Paper — Nothing says wedding like bouquets of blossoms. If you are an ardent gardener or just enjoy the look of flowers on a wedding invitation, this idea might spark your interest. If you see a pretty bloom you like, pick it and take it home with you. The more you can find the better. Place the flower in between two sheets of paper and put a large book on top of it. After a few days remove the book and you will have a pressed flower to glue as an embellishment to your invitation. Rubber Stamps — Does the idea of handwriting your return address on tons of envelopes sound like a daunting task? Printed return address labels can be boring and unoriginal. Consider making a stamp for this purpose. Many local craft stores allow for your information to be printed on a stamp. This is the perfect alternative to spending valuable wedding planning time printing your name on hundreds of envelopes. Not only are you able to pick out a fun font for this idea, but you can purchase different colored ink pads for this purpose. In order to save on labor and time, recruit family members to help you with assembling, printing, and decorating your invitations. An assembly line is perfect for this task. Have one member decorate, one individual to stuff the envelope, and employ younger members to lick the envelopes. Let your creativity shine when creating your wedding invitations. Not only are you saving money by making your own but you are also creating a fantastic first impression on your guests when they receive your invitation.